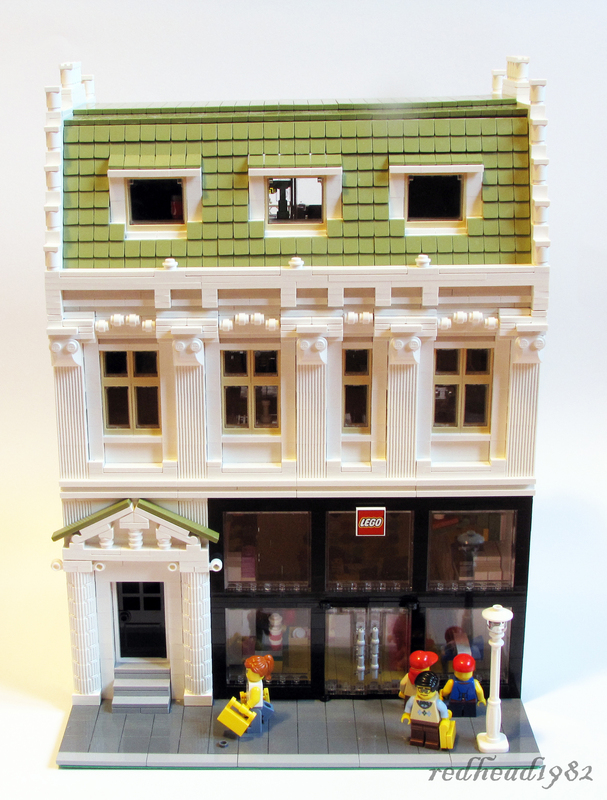 If you’re looking for the perfect vintage, you need not look further than Jason Skaare’s 18th modular building, the Wine Shop. In addition to the great wines on offer, the building also packs a lot of great details and clever parts use, inside and out. I particularly like the shop sign incorporating the vines and wine glass, the use of the barrels as planters and the use of the crates to get the panel effect at the bottom go the building. Here is a close up of my favourite part of the outside of the building – the terrace, complete with deckchairs and a the vine covered trellis. How relaxed would you be hanging out here? The clever details continue inside the fully furnished interior, with a unique shelf for the wine bottles and great stereo unit. Head over to Flickr for more images of Jason’s Wine Shop. The New York Townhouse by Nightfall (Stefan) has captured the essence of townhouse living in the Big Apple. I love the crispness of the colour scheme, and the way the contrasting green of the roof actually ties in with the green leaves on the tree. There’s also some clever parts usage in the balconies on the first floor. While the front of the building is very much New York, the back of the building feels more like a holiday villa. That probably makes it the perfect house to come home to after working all day in the city! Nightfall’s New York Townhouse is also beautifully furnished, with some lovely modern furniture. Check it out here! kevin8 (Mauro Cavinato) has added a garden extension to his stunning Modular City Mansion, providing a peaceful space to retreat from the hustle and bustle of the city. Packed with clever details and parts usage, the Modular City Mansion isn’t short on inspiration. I particularly like the small potted plants framing the entrance and the skeleton leg balustrade. Check out the Flickr album for more images of this gorgeous building and the new extension! Redhead’s latest modular building impresses with a textured facade and contrasting colours. 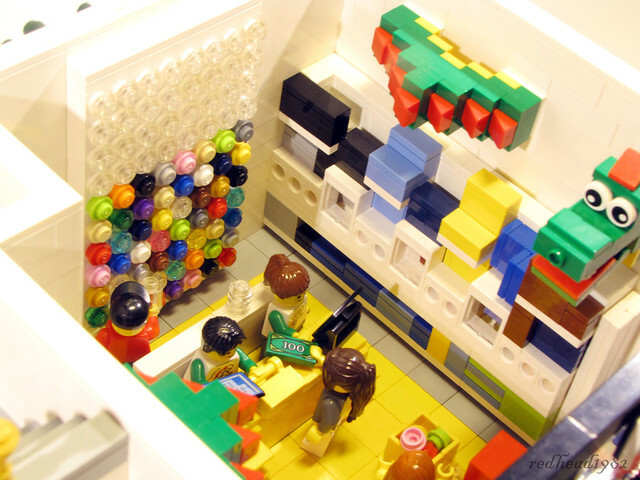 Between the gorgeous facade, the luxuriously appointed interior and the Lego store at your door, I think this apartment comes pretty close to being a perfect abode. The LEGO brand store is fully stocked, with a huge PAB wall, and even a Brickley! Head over to the flickr set to check out some more angles and the details of the fully furnished apartment. After what seemed like an eternity after the rest of the world had gotten theirs, my Shop@Home order with the Parisian Restaurant (10243) finally arrived in my little outpost in Brisbane, Australia, last night. What can I say that the title of this post already doesn’t? It is simply gorgeous. I love the colour, the kitchen, the window trims on the ground floor and the first floor, the dark blue roof, the white decorations on the roof, the hideaway bed, the outdoor seating area, the entrance, the scooter, the new bowl part in dark red, olive green bricks, the curtains, etc, etc. With so many details and interesting techniques, the Parisian Restaurant was also a great modular to build. I only have one gripe and that is that my shells didn’t want to stay closed. The picture above is taken on a time delay with me holding the shells closed until just before the shot was taken. PS. My image shows a few more minifigures than actually come with the set. My daughter insisted that all the girls should have dinner at the Parisian Restaurant. The photo doesn’t include the ones that were lining up outside for their turn! PSS. My original title for this post was going to be just “Perfection”, but in French. However, according to Google Translate, the translation for “perfection” is “perfection”?? I’m currently very jelly of Nathan at Rebrickable and Huw at Brickset, who were both sent early release copies of the Parisian Restaurant (10243) for review. Unfortunately, mere mortals like myself will need to drool over Nathan’s review or Huw’s review until the set is released to the public. When I first learnt that LEGO’s next modular building was going to be a Parisian restaurant, I think I said I wasn’t going to imagine what it would look like in case I was disappointed. Well, I didn’t heed my own warning and have pretty much been visualising a typical Haussmann building in tan or light bluish grey. The 10243 Parisian Restaurant is not a Haussmann, but it is definitely a beautiful building. Actually, that’s not right, it much more than beautiful … it’s awesome, it’s gorgeous, and it’s packed with clever details and building techniques. And it has a scooter!! Better still, we don’t have to wait until March, with the Parisian Restaurant scheduled for release in January 2014. Head over to Eurobricks to see lots more high resolution images.